Outstanding view ... in every season! I think this must surely be the most truly 4-seasonal garden in the UK! Wow, I have looked at all the photos, trying to decide which season I like the best and I just can't ...they are all equally beautiful. I try really hard to get colour all year round using shrubs but you have it totally sussed! Congratulations. I hope one day I'll be able to visit, but the photos have given me SO much pleasure...thanks so much for putting them on. Thanks for all your kind comments, everyone. We are still amazed that BBC Gardeners' World found us and spent so many days filming the garden through the seasons. It gives us so much pleasure to be able to raise money for charity through a hobby we both really enjoy. If anyone is in the area anytime (not just on an open day) you are welcome to call in - that's providing we can hear the bell - we are out of earshot when we are down the garden. One workman climbed on the garage roof to catch our attention! When we are in our neighbour's garden (where we use half his land for a "working yard") it takes a long time to run all the way back to the house and visitors have sometimes gone away. Also - you have to accept us in our garden "scruffies". They seem to be the regular clothing these days! 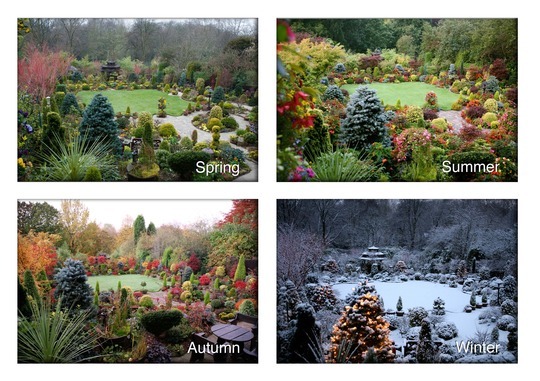 A lovely set of photo's .....you must be so proud that your hard work produces such lovely gardens all the year round. Well done both! So much hard work over the years but worth every second I bet. Just found these pictures of your truly amazing garden, beautiful what more can I say!!!!!!! Thanks, everyone for your kind comments. It's nearly midnight and we are just about to go to bed - we have our first open day tomorrow (Sunday) at the same time as the Gardeners' World half-hour TV programme about our garden is being broadcast at 11.30 am - so we won't be able to watch it live! We didn't have much sleep last night as we watched the Olympic Winter Games opening ceremony - one of our sons is in Canada for a year and has passed the rigorous selection process to be accepted as a volunteer at the games. We thoroughly enjoyed the ceremony - rather surreal at that time in the early morning! Had a last minute hitch for the open day - we have just had a new toilet and plumbing in the room that visitors use. Spent a few hours redecorating and thought we'd wash the curtains since all those harlequin ladybirds had taken up residence in them. Bad decision! The curtains ended up in shreds (they were rather old) and I had to make a quick shopping trip to buy more material and stayed up last night sewing new curtains!!! It's turning into quite a weekend! Think we'll celebrate tomorrow evening - after the open day. Perhaps a bottle of wine and a Chinese meal to celebrate their New Year and a chance to watch the programme we've hopefully managed to video! One weekend you wo'nt forget in a hurry. Good news about your son. We too watched the opening ceremony. You are a Jack of all trades aren't you.........fantastic gardeners and decorators and curtain making too. Hope you enjoy your celebratory meal and bottle of wine, you have certainly earned it. I am looking forward to watching G World. Just watched G World. You and the gardens were brilliant. I watched on Sunday morning, your garden was wonderful and it was very nice to see you both do so well on tv :-)) How do you ever find the time to come on GOY? !! Is the program somewhere on the Internet, maybe YouTube? Sorry, we don't believe it is available on the Internet. Perhaps it will be transmitted again on the television. Best wishes.